Medication safety was a concern for Jerry, age 71, heading home from the drug store with his latest prescription, he placed all his pill bottles on the kitchen counter and counted them. “I take five different medications, and you take four,” he said to his wife. “We need a system. We need to know what medicines we have, what they’re for, and when we should take them.” Modern medicine has made our lives better in many ways. It has helped us live longer, healthier lives. But people over 65 have to be careful when taking medications, especially when they’re taking many different drugs. Remind your doctor or nurse about your allergies and any problems you have had with medicines, such as rashes, indigestion, dizziness, or mood changes. What does “as needed” mean? = When should I stop taking the medicine? When getting a prescription filled, sometimes you can choose between either a generic or brand-name drug. 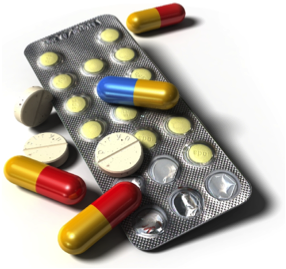 Generic and brand-name medicines are alike because they act the same way in the body. They contain the same active ingredients—the part of the medicine that makes it work. A generic drug is the same as a brand-name drug in dosage, safety, strength, quality, the way it works, the way it is taken, and the way it should be used. Generic drugs usually cost less. If you want a generic drug, ask your healthcare provider if that’s a choice. Not all drugs are available in the generic form, and there might be medical reasons your doctor prefers the brand-name medicine. Make a list of all the medicines you take, including over-the-counter products and dietary supplements. Show it to all your healthcare providers including physical therapists and dentists. Keep one copy in your medicine cabinet and one in your wallet or pocketbook. The list should include the: name of each medicine, doctor who prescribed it, reason it was prescribed, amount you take, and time(s) you take it. Take your medicine until it’s finished or until your doctor says it’s okay to stop. Avoid mixing alcohol and medicine. Some medicines may not work correctly or may make you sick if taken with alcohol. Take your medicine until it’s finished or until your doctor says it’s okay to stop. Online: Medicines can cost a lot. If you have a drug plan through your insurance, you can probably save money by ordering yours from them rather than at your neighborhood pharmacy. Or, you might be thinking about buying yours on the Internet. But how can you tell which websites are safe and reliable? The Food and Drug Administration has more information on buying medicines and medical products online. Many of the ideas for prescription drugs are also true for over-the-counter (OTC) drugs, like medicines to relieve coughs, cold, allergies, pain, and heartburn. Be careful when taking an OTC. For example, don’t take a cough and cold product if you only have a runny nose and no cough. And, check with your doctor before taking aspirin if you are on a blood-thinning medicine, because aspirin also slows blood clotting. Be careful—over-the-counter medicines can have side effects. Read the label—even if you have used the OTC product in the past. Important information can change. Remember, medicines—whether prescription or over-the-counter—that are strong enough to cure you can also be strong enough to hurt you if they aren’t used the right way. Learn to be a smart consumer of medicine. The following link will connect you to our newsletter and E-Book sign up page – newsletter/ebook/signup.